The wine industry is enjoying a boom in popularity today that began in the early 90’s with the airing of “The French Paradox” on the TV show Sixty Minutes. On slow news days, the media still dust off stories about the health benefits of wine! But not until now has there been a useful guide on how to integrate wine as part of a healthy weight-loss plan. 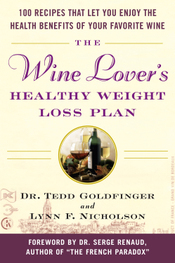 Now we have such a guide in the form of the new book “The Wine Lover’s Healthy Weight Loss Plan”, co-authored by Cardiologist Tedd Goldfinger (yeah, I too hear the James Bond theme song in my head, I bet he hates that) and Chef Lynn Nicholson. DC) Hello Lynn! I’d like to open with a question I enjoy asking fellow wine-lovers. I usually ask it late at night after a few glasses of wine, but since we don’t have that kind of time I’ll just jump right in with it – what is your desert island wine, the wine you would drink if stranded with no other wine, ever. But of course a favorite wine must be paired with just the right cuisine, companion(s) and setting. I think of terroir as extending beyond the vineyard – the “total experience” that makes the wine a favorite – at least at that time. Next time, an entirely new experience can drive a new favorite! DC) Wine as a part of life. I like that. Lynn, I known enough chefs to realize the glory and romance you sometimes enjoy is a thin veneer covering a core of hard work, late hours, and a lot sweat. I suspect the romance is insufficient to keep most chefs in the field, and that they are more motivated by internal factors – a love of food. Can you tell us about your first Epiphany moment, when you realized that your work was going to revolve around food? LN) My “food and wine” epiphanies” came together the summer of 1990 at The Herbfarm Restaurant, then in Fall City, WA (now in Woodinville, WA). My food/wine background is strongly embedded in that special summer where I enjoyed several dinners and numerous cooking and herb classes. Dinner there is a once-in-a-lifetime dining event: five hours, nine courses, an unparalleled theatrical production with the perfect Northwest wines. Their Chef, Jerry Traunfeld, uses the essence of herbs in all his dishes. For example, he will smoke wild Coho salmon over the dried stems of basil and lemon verbena and the result is a perfect balance of delicate flavors, which is then paired with the perfect local wine. DC) Sounds like a fabulous dining experience. LN) I felt like Lynn in Wonderland! After four jaw dropping/wallet breaking dinners and numerous culinary and herbals classes, I learned that by cooking with local ingredients, season by season, you develop a better understanding of them, which is ultimately reflected in their preparation and enjoyment. And I learned that, when it comes to wine, it is best to start with those of the region, as they are the natural accompaniments to regional foods. DC) I have seen first-hand how the movie Sideways has had more impact on our nation’s wine habits than anything since the 1992 60 Minutes episode on the French Paradox. That single 60 Minutes feature began an uptick in annual wine consumption that has continued year after year. But even after that episode, wine has long been considered “empty calories” by the authors of diet books. Do you believe this is true? LN) Absolutely not, that is part of what our book is about. The 60 Minutes episode you talk about featured Professors Serge Renaud of Bordeaux and R. Curtis Ellison of Boston. Renaud authored an epidemiological study which presented the indisputable fact that their wine drinking habits permit the French to live longer and avoid heart attacks despite an exceptionally rich diet that would otherwise almost certainly result in heart and blood vessel disease. Professor Ellison was a seminal investigator for the Framingham Heart Study that began in 1948. This longitudinal study of 5,209 New Englanders spanned decades, with subjects checking in every two years for medical tests. The study reported the influences of lifestyle on the lifetime risk of heart disease and cardiac death, and formed the basis for much of our knowledge about how high blood pressure, diabetes, smoking and high cholesterol affect heart disease. Ellison reported that drinking alcohol in moderation protected the heart against disease but this information was censored from the formal reports out of fear that alcohol consumption would increase, along with the well known deleterious effects of alcoholism. So for years American society has been in the dark about the healthy effects of alcohol. This censorship may have contributed to our epidemic of heart disease. DC) Lynn, is all alcohol created equally? LN) No, wine is the preferred alcohol. Studies have shown that the benefits of wine are significantly greater than that of other forms of alcohol. Now, distilled spirits do reduce the risk of cardiovascular disease. It’s been shown that moderate alcohol consumption reduces mortality from all causes by 30-50%, reducing cardiovascular disease by up to 50% and cancer by up to 24%. Alcohol is also one of the most potent means of increasing high density lipoprotein (HDL), the good cholesterol. HDL is good because it acts as a scavenger in removing cholesterol and fat from arterial walls and bringing them to the liver for degradation and elimination. Those are the benefits of alcohol by itself. But the health benefits of wine are derived in equal parts from the alcohol and the nonalcoholic components of the wine. The most important is the nonalcoholic components, called polpyphenols which are mostly derived from the grape’s seeds and skins. Polyphenols are organic compounds that have a number of important functions in wine and contribute to its bitterness and astringency, especially in red wine. The total amount of polyphenols in a glass of red wine is about 200 mg, compared to a glass of white wine which has 40 mg., thus there are five (5) times more bioactive life-sustaining polyphenols in red wine than in white wine. LN) Hang in there with me for a minute, this is the important stuff. You see, polyphenols are powerful antioxidants, and antioxidants reduce the damage caused by the body’s free radicals toxic waste products. These bad guys can lead to degenerative diseases such as cancer, Alzheimer’s, Parkinson’s and aging. The benchmark antioxidants are vitamins E and C, but wine in particular contains the strongest antioxidants in nature called resveratrol, quercitin and epicatechin, which are five times stronger than vitamin E. Studies have shown that no matter how much vitamin E you take, its antioxidant activity plateaus at 20%, whereas wines’ antioxidants will plateau at 100% after a couple of glasses. And, unlike beer and spirits, wine is the beverage of moderation. Moderate wine drinking (5 ounces per day for women; 10 ounces for men) and a Mediterranean diet are the keys to better health and a longer life. Wine is meant to be consumed with food, at the table, over conversation with family and friends. DC) Wow, most people i know consume a bit more than that at most meals. That reminds me of an interview with the great beer guru Micahel Jackson (NOT the late rock star) who distained Lite beers, and suggested this healthy alternative – “If you’re worried about the calories, just drink better beer and have less of it, you’ll get more satisfaction”. I think the same applies to wine – drink less but better! Now let me change the topic for a moment. Let’s talk about taste memory – I believe the ability to imagine tastes, and the combination of tastes, is a gift commonly found among the best chefs and wine merchants. Do you do anything to actively develop your taste memory, so that you can predict great wine and food pairings? LN) I don’t have a magic formula for food/wine pairings or perfecting my taste memory. Taste memory is an intriguing topic … but how to translate it into food/wine pairings…? I always start with a wine I know I will enjoy. Then it is nearly impossible to ruin a good meal. I urge people to follow their own tastes and to experiment. Wine is a fundamental part of the meal; it joins the flavor of the meal. I offer a few guidelines, such as concentrating on fresh and healthy ingredients, keeping the flavors uncomplicated and complementary; and not allowing the food to overwhelm the wine, or vice versa. Subjectivity and personal bias ultimately dominate any food and wine pairing. Experimenting with food and wine pairings provides for good table conversation and lively debate. DC) Ahhh, the world would be a better place if more people followed that advice. But let’s go back to your chemistry discussion of a few minutes ago when you mentioned the beneficial anti-oxidants in the skins of red grapes. At our house we enjoy as much white wine as we do red. Can you tell me about a bit more about the benefits of white wine? DC) Your book covers ways to shop for wine and healthy food. I don’t want you to give the whole book away, but can you give our readers a few tidbits? LN) On the Wine Lover’s Plan we encourage you to make wine and food enjoyable in your house and at your table. Experiment, try many different wines. It is believed that younger wines are of greater nutritional and health value than aged wines, since tannins are fuller and pigments more dense. Thus, there is no need to go broke buying wines worthy of aging. Share taste experiences and new discoveries with your friends; plan a wine tasting event! When shopping for food we suggest you shop frequently, utilize a local farmer’s market, buy locally grown and preferably organic and seasonal fresh produce. Be creative, experiment with herbs and spices and explore globally inspired, healthy cooking. DC) That’s great news Lynn, that’s how my family likes to eat! But we have made a conscious decision to focus on eating well at home, and take the time to do so (and enjoy doing it). Most families are so short on time that “convenience foods” become their default – they don’t CHOOSE to eat that way, it just sort of becomes a habit. So I want to do whatever I can to encourage anyone who will listen to eat more home-coked meals – it’s a great way to spend time with family and friends, and it’s much better for you! Speaking of which, is there any truth to the rumor that you may be providing a recipe from your book for my readers to sample? Combine the cinnamon, allspice, coriander, nutmeg, and ginger in a small bowl and stir to mix. Sprinkle the spice mixture evenly over a piece of plastic wrap or waxed paper slightly longer than the tenderloins. Brush pork all over with the soy sauce, then roll in the spices to coat it evenly. Wrap well in plastic wrap and marinate in refrigerator for at least 6 hours or overnight. Preheat oven to 375ºF. Bring pork to room temperature, about 30 minutes prior to cooking. Heat the olive oil in a large ovenproof skillet over medium-high heat. Discard the plastic from the pork and brown the tenderloin on all sides, 4 to 5 minutes total. Transfer the skillet to the oven and bake until just a touch of pink remains in the center of the pork (about 150°F internal temperature), 12 to 15 minutes. Remove the pork from the oven and set on a cutting board to rest, covered with foil to keep warm. Add the cassis to the skillet and cook over medium-high heat for about 1 minute, stirring to lift up cooked bits stuck to the bottom. Add the cherries, broth, and mint. Bring to a boil until reduced by about half, 2 to 3 minutes. Take the skillet from the heat and whisk in the butter until it has smoothly melted into the sauce. Season the sauce with salt and pepper to taste. Cut the pork tenderloins on the diagonal into slices about 1 inch thick. Arrange the slices, slightly overlapping, on warmed individual plates. Pour the cherry and mint sauce over the pork and serve. DC) Thanks Lynn, I can’t wait to try that at home. And thanks for your time today. If there was one thing you could tell my readers about how to use wine in to improve their health, what would it be? LN) Wine lover’s can raise their glasses and rejoice! The benefits from wine’s key ingredients (alcohol and antioxidants) are short-term and not cumulative, so it is essential that wine be consumed regularly with healthy food choices. Periods of abstinence from wine, from days to weeks, may negate the benefit to your body’s metabolism and physiology. I’d also like to leave you with a bit about our book: The Wine Lover’s Healthy Weight Loss Plan is a celebration of life. It encompasses four elements – 1) an active lifestyle, 2) delectable, healthy cuisine paired with 3) vivacious wines, and 4) sharing meals with family and friends. Like you, we hope to inspire readers, through our passionate commitment to Mediterranean foods, to embrace a lifestyle that allows them to eat healthy foods, drink delicious wine, and begin to savor life … and to manage their weight at the same time! To learn more, check out our book at www.TheWineLoversDiet.com. "How big is a Small Fire?" and "Pinot Harvest"
It surely is an interesting interview but I wonder what does a chef has to do with a wine blog? Hi John, thanks for the question. Since Lynn’s book is about the use of wine as part of an intelligent weight loss program, it struck me as worthy of a posting on my wine blog. I hope you agree once you read through it, but if not, please let me know what you’d RATHER see in a wine blog. I’ll either adjust some of my content or recommend other blogs that may fit you better. Wow, a weight loss plan revolving around drinking wine. Can’t wait for the ice cream plan!